The main course of our New Years Eve dinner last night was a herb crusted rack of lamb. I had actually never prepared a rack of lamb, even though lamb chops are one of my favorite foods, because they are also generally on the expensive side. However, that makes New Years (or any holiday) the perfect occasion for preparing such a dish. I purchased a 3 pound rack of lamb for about $40 at M&S Prime Meats (a wonderful Italian Market and butcher) here in Park Slope. I found an online recipe that was surprisingly simple from the now-deceased Gourmet Magazine online at Epicurious. The original recipe can be found here. I made some changes that are below for the final recipe that I adapted. Here is the recipe that I prepared – I used a lot more herbs than the original recipe called for, which was absolutely delicious. To prepare the racks of lamb, heat a Dutch oven with oil for two minutes. Rub the meat with the salt and pepper, and sear on all sides, about 5 minutes. Transfer to a roasting pan and coat with the herb mixture. Coat well and densely, pressing so that the herbs adhere to the meat on all sides. We cooked the meat on convection roast setting for about 40 minutes at 350 until it was tender and slightly pink. After about 30 minutes, cover the meat with aluminum foil for the duration of the cooking process. 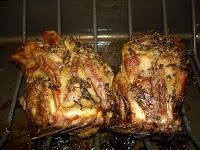 However, this process will vary depending on the oven you use, and the size and shape of the rack of lamb. Cut each rack into chops and serve. In my case, we had 6 chops (3 each) which was plenty. These are single chops which are a bit harder to cut into chops and not as "pretty" looking as french double chops, which we will use next time. Our pug, Dakota (who normally does not beg for food unless it is one of her favorites) went crazy for this – she really wanted a bite! After dinner she ran round the apartment looking under the table to see if there was just one morsel left. We did save a tiny bite for her New Years Eve treat. Preparing a rack of lamb may be a bit pricey, but is actually quite simple and not a lengthy process like braising meat. Happy New Years! I agree that lamb can be rather expensive. I have used a meat thermometer that can be read outside the oven. I have taken the meat out at 125 degrees and let it rest. This has given consistantly medium to medium rare(pink) chops.This takes the guess work out of the equation. A great suggestion. I was planning on doing the same but my meat thermometer is off it its calibration - I plan to pick up a new one this week.